Those shoes. They sit on the floor, over in the corner, almost out of the way next to the chair. But they’re not; they certainly are in the way. I look at them each day as I pass between rooms. I look at them, see them sitting there, waiting. You can tell that they’re begging to be used, begging to be worn. The shoes want to move, they want to get up and go, they want to dance again. It’s been 14 years since she left. A very long 14 years. Her passing was a shock to the entire community, and most of all a shock to us. She wore those shoes often. In fact, they were her favorite shoes. I remember the day she brought them home, she was so happy to have finally found them on sale. After a while it made sense to rearrange the house: clean, move things, pack some of her items away. Those shoes were among her favorites so they stayed out, much like the pictures that hang on the wall – left out as memories, as reminders of what once was, of the way things used to be. Of a life, and of happy times. Two months ago I packed the shoes away in the attic; I thought it was time. Not that they were a bother, I just thought it was time. I thought I would never see them again. Three days ago the shoes appeared on the floor: sitting patiently, waiting as they had done for 14 years. Each day as I pass between rooms, I look at them, see them sitting there, waiting. And I wonder how they returned. The shoes are like memories. Some things just won't stay put away. we all have totems and tangible pieces of lives lost. I especially like that the shoes did not want to be packed away. Oh these shoes had determination for sure ~~ with a little magic thrown in for good measure. Nice Magpie! 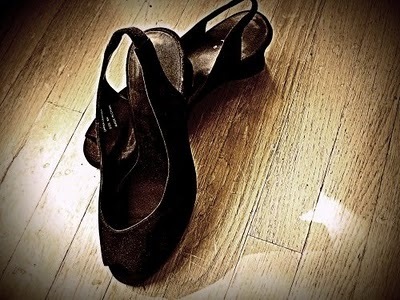 Those shoes want to dance again! Nice twist. I was prepared for a much sadder ending. Great twist at the end. I love the idea of leaving the shoes out as a memory--very touching. Cool story! You wonder how they returned? "She" put them there. they just want to feel needed once more...dont we all. nice magpie. There's something so very personal about a person's shoes. So much of their essence is transferred to them. Poignant piece. Deeply felt, and a nice little ghost story, not scary at all..my cup of tea!